Arsenal manager Unai Emery has revealed that Shkodran Mustafi could potentially make the travelling squad for the weekend's Premier League encounter versus Liverpool. The Gunners have been immensely hampered with injuries in the defensive department this term and they are currently with just two senior centre-backs in their ranks. However, speaking ahead of the Reds game, Emery has confirmed Mustafi could be in line to feature, provided he can pass a late fitness test leading up to the Anfield encounter. 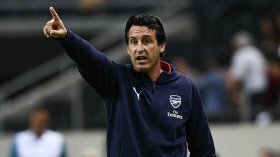 Nonetheless, the German is unlikely to have the match sharpness after being out for reasonable amount of time and this would no doubt present Emery with a selection headache for the Reds game. Sokratis and Laurent Koscielny appear the likely combination to feature in the defence but the latter's showing has come for criticism of late with him struggling especially with the aerial threat from the opposition.